Robert M. Kueny was born in Kenosha in 1931. He remained a resident of the Kenosha area for his entire life. He was very active supporting local service organizations especially those supporting the youth. A near drowning in Lake Michigan as a child led Robert to the Kenosha Youth Foundation (currently the Kenosha YMCA) for swimming lessons. He maintained that skill into adulthood, becoming a Masters Swimmer participating in competitions through age 70. He was consistently among the top finishers, although the awards and accolades did not concern him. He graduated from the University of Wisconsin in 1953. In 1953-1954, he was in the U.S. Army Signal Corps in Korea. 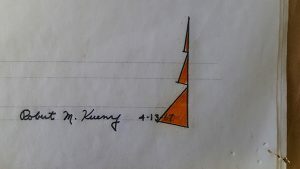 Upon returning home, Mr. Kueny spent 1955 as a member of the Frank Lloyd Wright Taliesin Fellowship. He worked for local architects from 1956-1959. Sadly, in 2003, we lost Robert to Alzheimer’s disease. We will greatly miss his insight and gentle spirit.